A month or so ago, I received a note from Sunil Manchikanti, a former student and designer/illustrator living in Brooklyn. I saw Sunil at ICON6, and enjoyed catching up. Sunil sent me a link to a valuable research tool, the stunningly comprehensive Flickr set of mid-20th century illustrators compiled by the invaluable Leif Peng. Suffice to say, it's a guaranteed visual treat to work your way through that material. It's also a sort of philosophical test: why is much of it so wonderful, and other of it such dreck? Discuss. A few days ago, in search of fresh examples of reportage drawing to show juniors, I parachuted into Peng's archive, and came across his contemporary reclamation of the work of Lowell Hess. I had been unaware of Hess's work, about which there is much to say, because it is so diverse. Mr. Hess is still alive, and still at it creatively speaking. My interest here and now is to show some of Hess's two-color work for Collier's, which in my view had extremely interesting art direction from the late 30s into the early 50s. 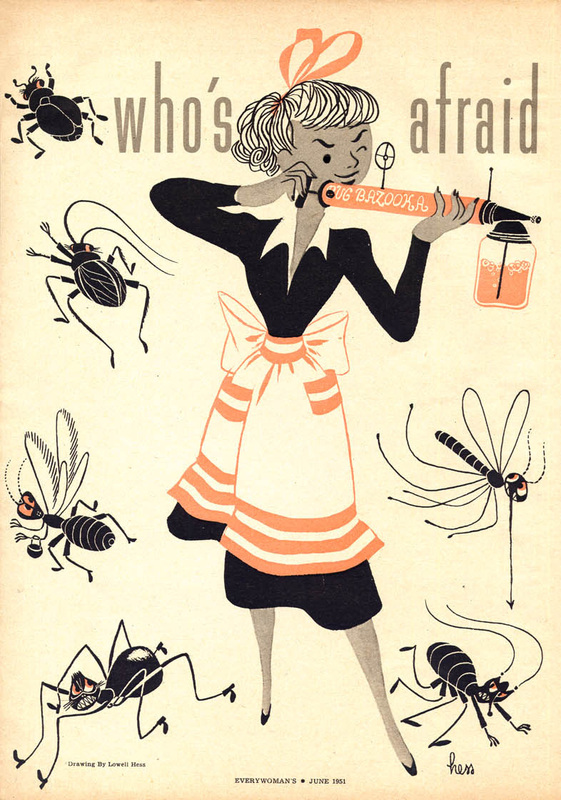 Hess did some covers for Collier's, but he also had a regular gig illustrating the humor column of the magazine. These are classic examples of visual economy and verve in a two color setting. They are also cousin to Rea Irvin's illustration work from ten years earlier in Snoot If You Must, by Lucius Beebe. (1943). But a pair of examples from Hess's work go right to the heart of two issues we talked about in class. The first is a long horizontal line drawing in black with additions in red and blue. The relevant aspects of this drawing have to do with 1) the variation in line density as way to create interest; 2) the use of black solids [e.g., pants and dress shapes] to anchor what would otherwise be a weightless tangle of lines (also true of the Irvin example, above); and 3) the use of secondary tone/color to create an additional set of shapes. I regret the scale of this image, which was quite small in print, because it would help to be able to zoom in and see the specifics of the red shapes. But even from helicopter height, you can see the variation in density; the use of red shape and pattern to create secondary emphases and rhythms. Consider the group standing in line on the right. Figures 1, 5 and 8 receive red pattern to contrast with the red and black shapes which characterize figures 2, 3, 4, 6 and 7. Meanwhile the building gets no red at all, to help separate it from the figures. It's easier to see some of the same issues (and more) on this spread from Every Woman Magazine in June 1951. The lady of the house gets down to the task of killing bugs with the kind of chemical spray pump that was standard issue in the world of Wile E. Coyote. First, see how the orange sherbet color is used to create new shapes. Without those stripes on the apron, her figure would be less interesting. The stripes are not chaperoned by a black contour line. In some of the work I saw today, equivalent passages were dominated by black line, leaving no communicative work to be performed by the second color. If so, why include the second color at all? Second, look at the negative line used to describe interior information on the black bugs. The negative contour permits black to be used as a fill color on the bugs; the resulting visual weight nails down the perimeter of the spread and keeps the whole thing from disintegrating into a spindly mass of line. Thanks, Mr. Hess, for the design lesson. And thanks to Sunil for the tip, and Mr. Peng for the monumental Flickr set! Lowell Hess, two-color spot illustration for Collier's Weekly, undated. Rea Irvin, Everybody was Mr. and Mrs. J. Dinsmore Tew, illustration for Snoot if you Must, by Lucius Beebe. 1943. Lowell Hess, spot illustration for Collier's Weekly (? ), July 1957. Lowell Hess, fiction illustration for Who's afraid of the big bad bug? Every Woman Magazine, June 1951. Lowell Hess, detail, Who's afraid of the big bad bug?